Casa Nostra is welcoming, smart and beautifully-lit. The restaurant has a really authentic feel encouraging you to kick back and enjoy good food and wine with family and friends. The roomy bar is especially handy with its late night license and for all those Mariah Carey’s out there karaoke is available on some nights. Casa Nostra plays host to a fantastic lounge/dining bar called 'The Den'. It’s decked up with leather sofas, subdued lighting and a magnificent ambience. There are booths in the lower floor lounge and an airy, pleasant dining room at the ground floor. 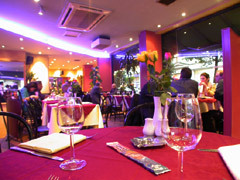 The decor is fresh and modern while the waitstaff maintain traditional Italian standards of service and friendliness. Patio seating is available when the weather permits. There is a fully stocked bar with some excellent selections perfect for pre-post dinner drinks. There's quite a bit to do around this part of town - real ale pubs and nice shops making this restaurant a good choice for a leisurely bite to eat after a long day shopping. The best parties are the light-hearted ones, and it would be impossible to have any other kind here at Casa Nostra. The restaurant is a classic, smart neighbourhood Italian, so the ambience is friendly and welcoming. Function room and dining area can be hired for up to 60 people and the whole bar and restaurant is available for hire on Sundays for up to 120 people. The restaurant has its own Karaoke equipment as well as ceiling mounted projector and big screen. Karaoke on Thursday and Friday nights. Diners only. Den Lounge Bar open till 1 am. The menu ranges over many Italian favourites, all home made style guaranteeing you delicious, healthy and genuine Italian. Enjoy hearty pasta�s, fresh antipasti, meat and fish dishes. The food is very reasonably priced and there is a fantastic selection of wines.